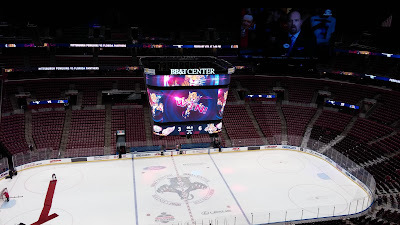 Going into the Detroit Red Wings game against the Florida Panthers at the BB&T Center on Thursday February 4, I expected a playoff type atmosphere. For the most part it was. There were 16, 991 fans and no shortage of Red Wings jerseys as you can see here in the pre-game skate from My Vantage Point in the Press Box. There were many "Let's Go Red Wings Chants" throughout the contest to go along with an octopus thrown onto the ice at the end of the game. However, at the end of the game, the Florida Panthers cruised to a 6-3 win and the rubber rats also got thrown onto the ice. This was Florida's third straight win over Detroit dating back to March 19, 2015 here in Sunrise, a 3-1 margin. 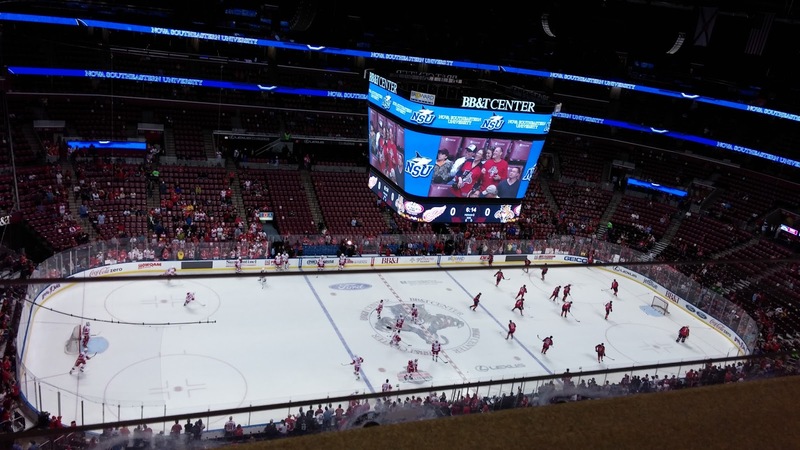 Florida won the first meeting of the season with an overtime 2-1 triumph at The Joe Louis Arena on November 29, 2015. There was a 2:36 minute stretch in this contest for the Panthers who scored three goals to take a 3-0 lead midway through the first period. In his South Florida debut, Larkin would score two goals against Panthers Goaltender Roberto Luongo, who stopped 36 shots for his ninth straight win at home and moved past Tony Esposito into seventh on the NHL's career wins list with 424. Another milestone came from the ageless 43-year old wonder Jaromir Jagr got his 1,100th career assist and joined five other players in NHL History: Wayne Gretzky, Ron Francis, Mark Messier, Ray Bourque and Paul Coffey. Jagr also had a goal in the game which was his 738th, putting him three behind Brett Hull for third on the NHL list. The game was Jagr's 1,800th game which includes playoff appearances. Jagr's big night occurred against Red Wings backup goaltender Jimmy Howard, who made 27 saves, but was saddled with his seventh consecutive loss. Howard's last win was on December 3, 2015 at home against the Arizona Coyotes. But to Howard's credit, he was facing a red hot Florida Panthers squad. After the Red Wings game, Florida's winning streak reached five, all of them by at least three goals. The Panthers have scored at least five goals in each of their last four games; the first time this has happened in franchise history. Florida improved to 16-0-1 when scoring at least four goals. To explain the type of season Florida has had, on February 2, 2016, the Panthers appeared on National Television for the first time in 2 years on the NBC Sports Network as they won an impressive 5-2 contest on the road against the Washington Capitals. I saw a first in this game. Red Wings Coach Jeff Blashill pulled Howard with 8:34 left in the third period while Detroit was on the power play which resulted in a Mike Green Goal. Former Red Wing and Panthers coach Gerard Gallant had a hard time explaining how the team has scored five goals in four straight games. "I don't know, you know," Gallant said. "Teams go on streaks. But we're putting pucks in the net and guys are confident. It's about putting pucks in the net, skating and being confident." While most people come to Florida for Spring Break, the Red Wings came to Florida after the All-Star Break. The night before in Tampa, Detroit dropped a 3-1 decision to the surging Tampa Bay Lightning (29-20-4) with Petr Mrazek between the pipes. Detroit left the Sunshine State going 0-2. Nevertheless, Red Wings Coach Jeff Blashill Didn't Leave Sunrise, FL., with a bad taste in his mouth despite his team being down 3-0 early in the game acknowledging that this lead was too much to overcome. "Yeah but to be honest, I thought we came out and played really well," Blashill said. I thought we played well early. I thought our battle level and compete level were really good. I thought our execution level was good for the most part. "In the end, I was really happy with the way our guys continued to battle back and I was real happy with the effort. I was real happy with their character." Blashill also added, " It was one of those nights from a process point I was happy with a lot of areas. That might sound funny to fans when you lose 6-3, but again anybody can come and watch the tape, and see a lot of the good things we did, and the execution was pretty good to be honest with you." On Saturday, February 6, the Red Wings would bounce back from this loss by hammering the New York Islanders 5-1 at the Joe Louis Arena. Red Wings Announcer Mickey Redmond admitted during the telecast that he wasn't looking forward to Detroit facing the Panthers Monday Night. By the end of Monday Night, Pavel Datsyuk and Mrazek allowed Redmond and Red Wings Nation to breathe easy as Detroit defeated Florida 3-0. This was a much needed win for Detroit as it seeks it's 25th straight playoff appearance. The only numbers that mattered on Monday was Jagr reached another milestone just by stepping on the ice. The Panthers forward appeared in his 1,600th career regular season game. Jagr was already 10th all-time in games played, but he's now 12 games behind Ray Bourque for ninth. Red Wings legend Gordie Howe holds the all-time record with 1,767. The other number was simply the Red Wings 3-0 shutout over Florida and Mrazek has a career-high four shutouts this season. He out played Panthers backup goaltender Al Montoya, who finished with 28 saves. On Wednesday Night against the Ottawa Senators, Mrazek turned in another stellar performance in a 3-1 victory. The Senators lone goal occurred with 2:24 left in the third period. Mrazek, who turns 24, on February 14, had a shutout streak snapped at 133:29 and improved his record to 21-10-4. Going into the Ottawa game, he had a 1.97 GAA. This is a guy who was the 141st overall draft pick by the Red Wings in the 2010 draft. The Red Wings return to Florida on March 19 at 7 PM and I can only imagine how intense the contest will be with playoff berths on the line. I'm definitely looking forward to seeing this game. As of this post, the Red Wings have a 28-18-8 record for 64 points and are in second place in the Eastern Conference Atlantic Division. Meanwhile Florida is leading the Atlantic Division with a 32-16-6 mark with 70 points. .
Scott Morganroth is a member of the Detroit Sports Broadcasters Association and can be reached at www.scottsports33.com.